How to add a turntable to your existing music system | What Hi-Fi? Has the resurgence of vinyl got you excited? Perhaps you’re a lapsed lover of the big, groovy discs, with a collection in the loft just begging to have the cobwebs blown away, or maybe a newcomer looking to inject a little analogue pop and crackle into your current, exclusively digital musical diet. But what if you don’t have a traditional hi-fi system to which you can simply connect a turntable? Or your current sound system is more geared towards TV sound, home cinema or multi-room? Actually, in practically all of these cases, adding a turntable is remarkably easy – as long as you know the type of turntable you’re looking for. 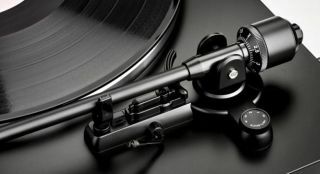 To help you, we’ve selected four non-traditional audio systems and outlined the sort of turntables you should be looking at and how to connect them. We’ve even given specific examples of turntables to check out. If the only audio system you’ve got is a soundbar or soundbase connected to your TV, you might be tempted to assume that adding a turntable simply isn’t on the cards – but you’d be wrong. In fact, with most soundbars and soundbases it’s a simple process; just choose the correct turntable, depending on which soundbar or soundbase you have. Let’s use our 2018 Award-winners as examples (we’ll tackle the Sonos Beam in the dedicated Sonos section below): all four of the Q Acoustics M2, Yamaha YAS-207, Dali Kubik One and Sony HT-ST5000 have a stereo analogue input, in the form of a pair of standard RCA terminals on the Q Acoustics, Yamaha and Dali, and a 3.5mm (headphone-style) connection on the Sony. That means you can add any turntable that has a phono stage built-in, or any standard turntable via an external phono stage. We’ll guess that at least part of your reason for choosing a soundbar or soundbase audio system was the neatness it offered, and you’re probably keen to avoid adding too many extra devices and their accompanying cables. So, we’re going to stick with turntables that have integrated phono stages for our recommendations. And, while these devices sound great for soundbars and soundbases, they don’t have the hi-fi credentials to make the most of serious, high-end kit, so it’s not worth spending a fortune on your new turntable. With all of that in mind, we think the Audio-Technica AT-LP3 would be the best turntable to add to almost any soundbar or soundbase. It costs just £169, is simple to set-up and sounds so good we gave it an Award. It has an integrated phono stage so you can connect it directly to any standard pair of stereo analogue terminals (you’ll need a 3.5mm adapter for the Sony HT-ST5000). And if you simply can’t stomach the idea of adding any extra cables to your system, you could consider a turntable that outputs via Bluetooth, which most soundbars and soundbases (including the four mentioned above) can receive. Bluetooth turntables are rare, and there’s an inevitable drop-off in sound quality compared to using cables, but if that’s the route you want to go down you could take a look at Sony’s new PS-LX310BT (£230), which we’ll be reviewing very soon. The great thing about an AV receiver (or AV amplifier) is that it has lots of inputs for all manner of audio and video devices, and connecting a turntable is not a problem. In fact, many AV receivers have a built-in phono stage, allowing you to connect any standard turntable directly. All of Denon’s 2018 AV receivers from the AVR-X1500H up have a phono stage, for example – simply connect your new deck to the ‘phono’ input and you’re sorted. However, the phono stage of an AV receiver will often fall short of the performance of an external phono stage or one built into a turntable. It’s worth taking this into account if you’re serious about sound quality. (If you do decide to add a turntable with a built-in phono stage or use an external phono stage, you need to avoid the phono input on your receiver and use one of the standard pairs of RCA terminals). In terms of recommendations, let’s again look at our Award-winning AV receivers. For the Denon AVR-X3500H (tested at £899 but now available for under £600), we’d recommend the Rega Planar 1 Plus (£329); Rega’s entry-level turntable in integrated phono stage form. The Denon AVC-X6500H (available for around £2000) is capable of making the most of a higher-end turntable – we’d suggest the Rega Planar 3 with the Elys 2 cartridge (£649). You could connect this directly to the amp’s phono input, but you’ll get more out of the set-up if you also add a dedicated phono stage. Rega’s own Fono MM MK3 (£199) is a strong choice. Our current home cinema amplifier of the year, the Sony STR-DN1080, doesn’t have a phono stage, but as we’ve suggested ignoring those of the Denons above, that’s no barrier to vinyl enjoyment. Here, we’d suggest the Sony PS-HX500 (£279), which will be a nice aesthetic match to the amp, sounds great, has an integrated phono stage and will even let you rip your vinyl to hi-res digital files via USB. A multi-room streaming system and turntable might not immediately sound like perfect bedfellows, but it’s surprisingly easy to add vinyl to Sonos - and if you do so you can hear your records in every room of the house. You need one of the Sonos units with a standard pair of stereo analogue terminals. That means having a Play:5 (for which you’ll also need an RCA-to-3.5mm adapter), Connect (or older ZP80 or ZP90), Connect:Amp (or older ZP100 or ZP120) or the new Sonos Amp. None of these has a built-in phono stage, so you’ll need a turntable that has one integrated, or buy an external phono stage at the same time. For the Sonos, we’d suggest the Sony PS-HX500, particularly if you’re connecting to the Sonos Amp, which is sonically capable enough to make more of the Sony’s musical talents. Connect the turntable to any of the Sonos devices listed above, and whatever vinyl you play on it can be streamed to every other Sonos in the house. What if you’ve got a multi-room system that isn’t Sonos? Most offer a similar route to turntable integration. The majority of Bluesound’s players have standard stereo RCA inputs, as do Audio Pro’s C5 and C10 speakers, and both systems support multi-room playback of your vinyl. If your existing music system consists of a simple wireless speaker, there’s still every chance that you’ll be able to connect a turntable. To do it ‘properly’, you want a wireless speaker with an analogue stereo input (whether that’s a pair of RCA terminals or a 3.5mm socket that will require an inexpensive adapter), and all of our 2018 Award-winners (the Ultimate Ears Roll 2, Audio Pro Addon C3, C10 and Drumfire) have just that. In those cases we’d suggest you check out the plug-and-play Audio-Technica AT-LP3. And even if your wireless speaker is entirely lacking physical inputs, you can connect a Bluetooth turntable such as the Sony PS-LX310BT, which we haven’t yet reviewed but does at least have good heritage behind it. In short, practically any wireless speaker can be connected to a turntable. The notable exceptions are the Sonos One, Play:1 and Play:3 (which can still receive streams from your turntable via another Sonos unit - see above) and the Apple HomePod.